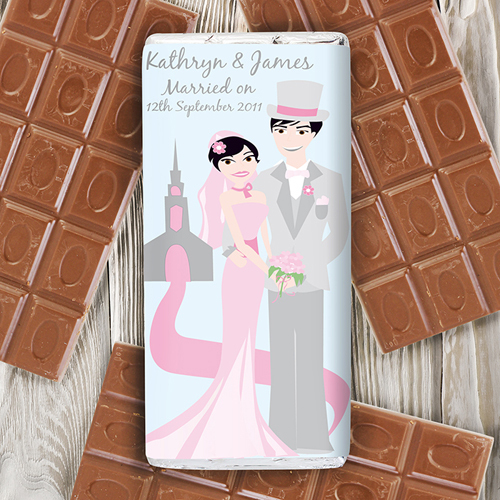 Make your wedding gift a unique one with this stylish personalised fabulous design chocolate bar! The bar can be personalised with bride and grooms name up to 15 characters per name and date of the wedding up to 20 characters. You can also personalise the back of the chocolate bar with any message over 2 lines and up to 30 characters per line. The wording 'Married On' is standard text. Personalise with bride and grooms name up to 15 characters per name and date of the wedding up to 20 characters. You can also personalise the back of the chocolate bar with any message over 2 lines and up to 30 characters per line.